Natalie Geisenberger of Germany competes. German luge queen Natalie Geisenberger defended her Olympic gold medal in the women's singles in style on Tuesday as her nation extended its stranglehold over the event to 20 years. The 30-year-old policewoman roared home to victory ahead of silver medal-winning compatriot Dajana Eitberger, claiming her third Olympic title with a flawless pair of runs at Pyeongchang's Olympic Sliding Centre. Canada's Alex Gough grabbed a nerve-jangling bronze, banishing the heartbreak of two fourth place finishes at Sochi. 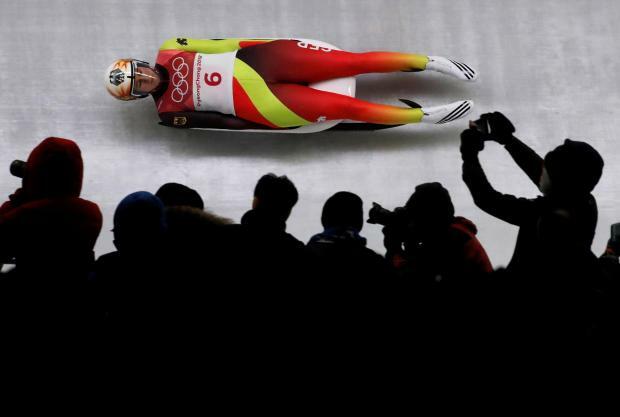 The German one-two returned the smiles to the faces of the luge superpower's camp, which was crestfallen on Sunday after defending men's champion Felix Loch crashed out of the medals with a horror final run. Geisenberger's fourth Olympic medal overall cemented her place as luge's most decorated woman and she shrieked with joy after crossing the finish of the fourth and final run with an aggregate time of three minutes and 5.232 seconds. "You could see with Loch, a very small mistake could have very serious consequences," the blonde Munich native told reporters after finishing a yawning 0.367 seconds ahead of Eitberger. "For me it was a real wake-up call. It brought back to my mind that the race is finished only when you go through the finish line on the fourth run and not earlier." Overnight leader after Monday's opening runs, Geisenberger built on her slender lead with a blazing third run of 46.28 seconds, piloting her sled with model German efficiency. As a statement, it was almost as loud as the rowdy finish-line terrace, and none came close to answering it. Second overnight, Eitberger's challenge stumbled with a bumpy third ride but German Vancouver champion Tatjana Huefner gave Geisenberger something to think about. The 34-year-old veteran strapped on her helmet with a face of thunder before firing down the track to slot in just behind Geisenberger ahead of the final run. There was still a mountain to climb, however, and it was Eitberger rather than Huefner who threw caution to the wind to soar into the gold medal position ahead of Geisenberger's finale. It did precisely nothing to rattle the champion who romped to victory with fire in her eyes, her nation's sixth consecutive gold in the event dating back to the 1998 Nagano Games. Sochi bronze medallist Erin Hamlin, the United States' first Olympic medal winner in luge, bowed out with a sixth-place finish in her fourth and final Games. A day after the anniversary of the death of Georgian luger Nodar Kumaritashvili, who died in a training accident before the Vancouver opening ceremony, a heavy crash by Hamlin's team mate Emily Sweeney sent a scare through the venue. Sweeney lost control and bounced off the sides of the track before losing her sled and hammering into a wall. She lay motionless for a few moments before being helped off the track by medical staff and the final run was suspended for about 10 minutes. After a long inspection by trainers, she got to her feet and walked groggily away, raising a cheer from spectators and relieved clapping from team mates down at the finish.